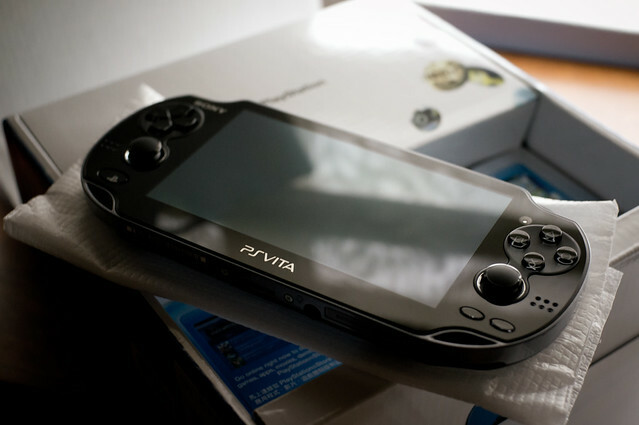 Playstation Vita is Sony’s latest portable entertainment device, the successor to the popular Playstation Portable (PSP) console released back in 2007. With a large brilliant display and powerful quad-core processors, it promises to deliver the ultimate portable gaming experience. Sony is also keeping up with the latest mobile device trends, and has put in place some location-based and social networking services in the Playstation Vita. 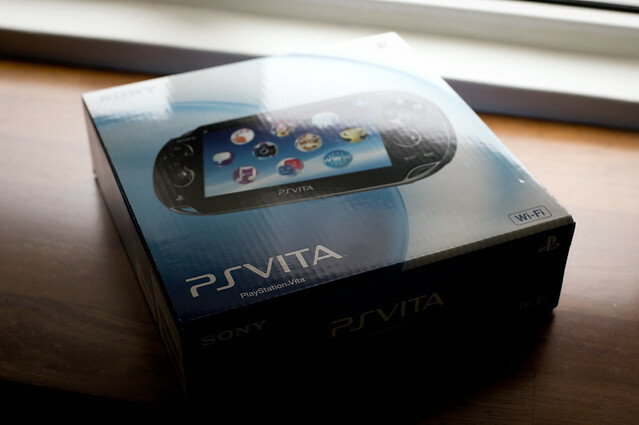 I managed to get myself a Playstation Vita (Hong Kong Import) two days ago. 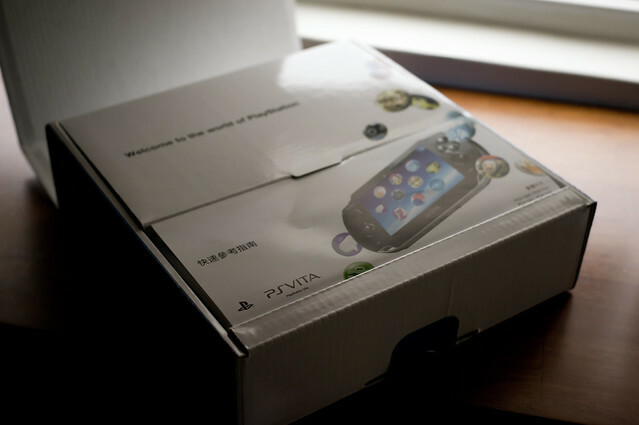 Here is my unboxing gallery and short review of the Playstation Vita Value Pack and Uncharted: Golden Abyss. Update! Check out my review of Lumines Electronic Symphony! Sony Hong Kong offers 3 different Playstation Vita “Value Packs” – these bundles are exclusive to Hong Kong. Given how Sony Singapore mimics Hong Kong, we might see these bundles at the Singapore launch in 2012. Value Packs start from HKD2,880 up to HKD3,480, depending on hardware configuration (3G/Wi-Fi or Wi-Fi only) and included game. Hidden under a few quick-start guides is the PS Vita, wrapped in a soft plastic sleeve. The 5″ OLED screen boasts a resolution of 960×544 (double of the PSP) which means a pixel density of 220ppi (pixels per inch). It is also a capacitive touchscreen. Also included in the console package is the USB cable (used for charging and data transfer) and power adapter. It is possible to charge the PS Vita using the USB cable, plugged into a computer. Just like the iPad, the PS Vita comes in two configurations. I decided to get the Wi-Fi only model in the end because I just didn’t feel like paying Singtel $10.70 every month for a MultiSIM. This means I lose the GPS and always-on 3G connectivity, which I think are nice features to have, but not necessary to enjoy games on the PS Vita. Besides, I can just use my iPhone as a mobile Wi-Fi hotspot. For those who are interested in 3G+Wi-Fi PS Vita, the Hong Kong sets are unlocked, meaning you are not tied down to any telecom service provider. You can freely use SIM cards from any service provider, which is a life-saver if you travel often and have SIM cards from all over the world. According to some friends, the PS Vita works well with Singapore 3G networks (Singtel, Starhub). It should also work on M1 with no problems. Please make sure your mobile data service plan has ample bandwidth allowance! Of course, I chose the value pack with Uncharted: Golden Abyss. 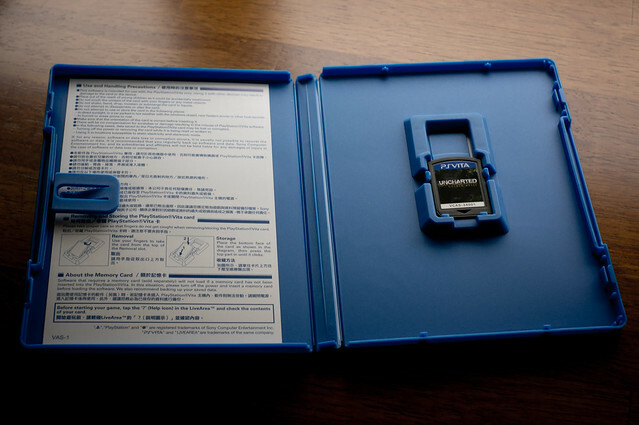 PS Vita games will not come with printed manuals. 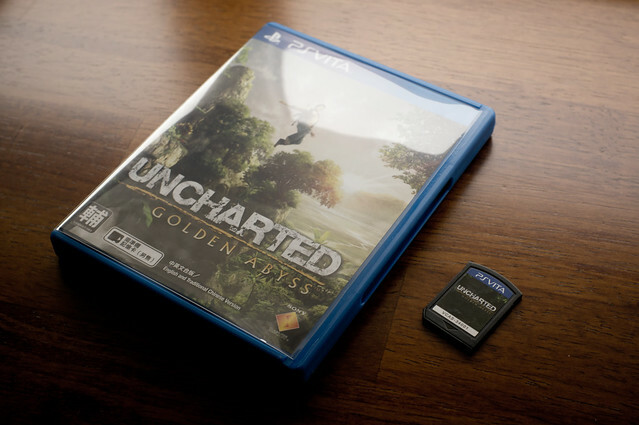 Uncharted: Golden Abyss comes with a digital manual which can be accessed from the game. I think this is great – less paper and printing, ability to refer to the manual any time, and of course, no more “I lost the manual” situations. 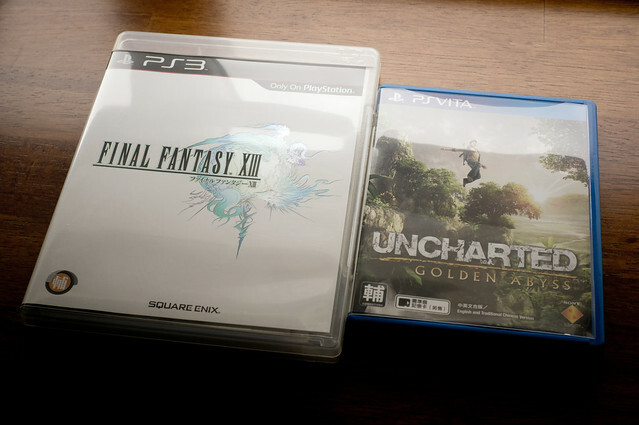 Game cases are very small (The FINAL FANTASY XIII case here is shorter than most DVD cases). 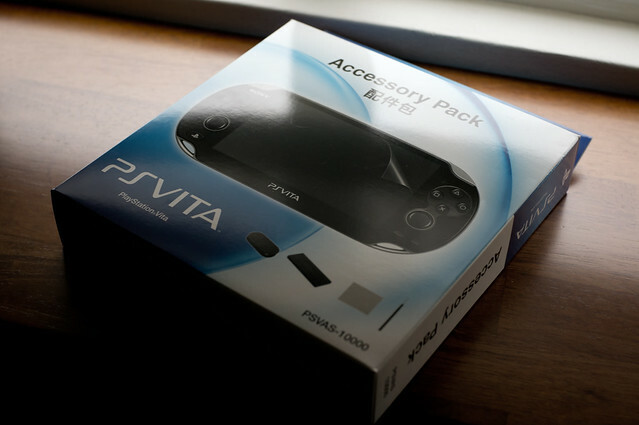 The Accessory Pack contains some essential items for the PS Vita. It can also be purchased separately for HKD250. The case, which I’m not going to use as it is too bulky. I still prefer the soft pouch that came with the PSP Value Pack. 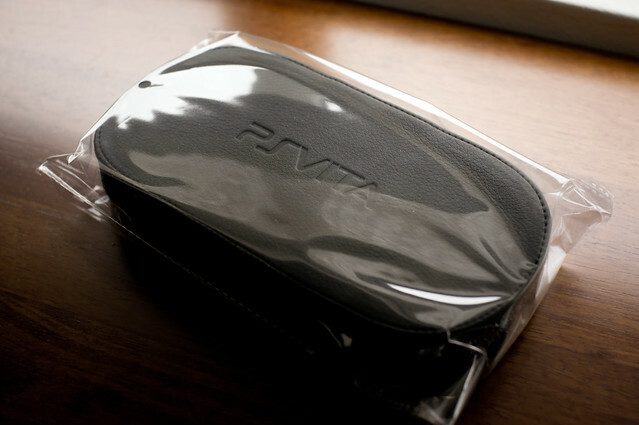 A similar soft pouch is available for the PS Vita but it is hard to find in Singapore now. 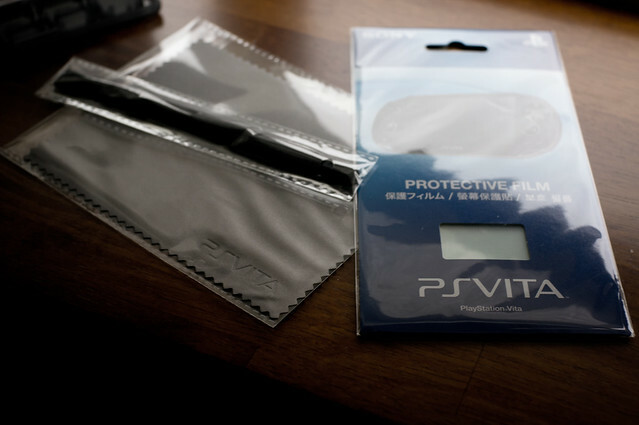 Surprisingly, the PS Vita can be kept in that original PSP pouch – albeit very tightly and it does not cover the full length. Since the PS Vita has a large and fantastic display, a screen protector is a definite must-have. The included film is very decent and clear – when applied, there is a small, about 3mm invisible border around the screen. The film comes with a sort of applicator, which assists users with the application of the screen protector. Simply place the applicator on the PS Vita and follow the instructions to peel off the films protecting the screen protector (yes I know). It is pain-free process, and I managed to apply the film without leaving any bubbles. However, because the applicator/template thing can still shift around, my film is slightly rotated. Oh well, I’ll fix it some other time. 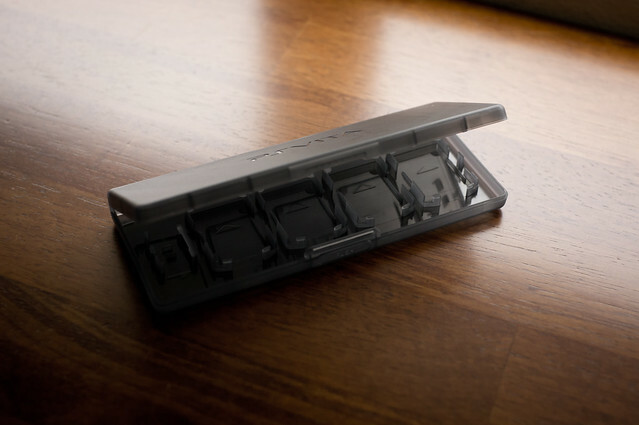 Also included is a card case, for storing PS Vita game cards and memory cards. Despite how they might look, the cards used for Playstation Vita are not SD cards, microSD cards or Memory Stick M2 cards. They are new and proprietary formats, which means that to increase storage capacity on their PS Vita, users have no choice but to buy Sony-branded memory cards. Now let’s take a look at what’s on the PS Vita. Sony is moving on from the XrossMediaBar interface (used for PSX, PSP and PS3) and developed a new interface for the PS Vita. It makes a lot more sense and is very quick to use. Pressing the “PS” button on the PS Vita will instantly allow the user to switch out of their Game or App into the LiveArea screen. Welcome Park is a mini-game/tutorial App that orientates users with the PS Vita controls and features. Party is a group-messaging/voice chat App for Playstation Vita users. It can be used while a game is running. Playstation Store allows users to purchase PS Vita games, PSP games and Apps. All PS Vita games that are sold on physical card formats are also available for sale here as digital downloads. 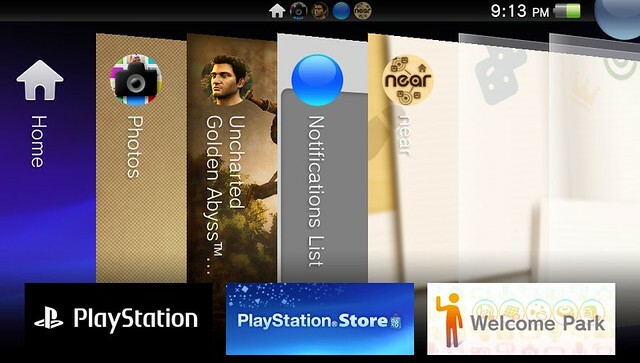 Near is the PS Vita’s location-service social networking feature. It is a little similar to the Nintendo 3DS StreetPass feature. PS Vita users can see what other users are playing around them. Friends is well, the place where you can view and manage friends connected on the Playstation Network. 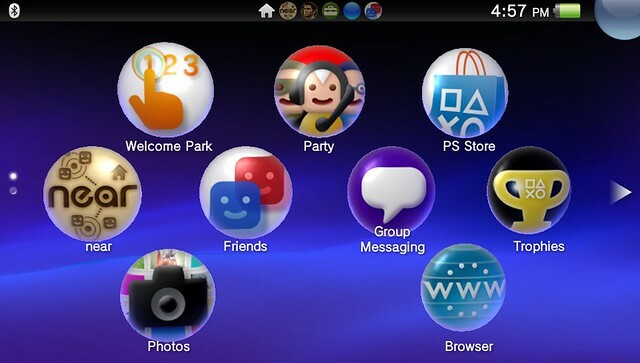 Group Messaging allows exchange of messages between PS Vita and PS3 users. Trophies is where you view your game achievements. All PS Vita titles support Trophies. 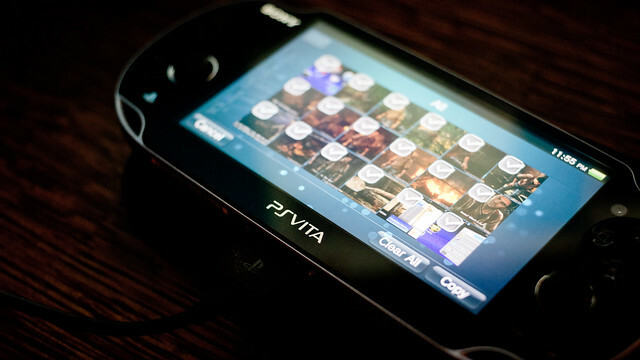 Multimedia Apps such as Videos, Music and Photos are also available on the PS Vita. The Photos App can also be used to capture images from the front and rear cameras. Similar to current smartphones, the LiveArea screens work just like Home Screens in iOS. The bubbles (or discs) can be re-arranged in similar ways, and the user is able to create more pages (or home screens) – and customize the background for each page. The PS Vita also has some sort of “Alt-Tab” screen which can be accessed by tapping on the “PS” button while in LiveArea. PS Vita supports some form of limited multi-tasking, allowing some Apps to run in the background while a game is running. Switching between applications and LiveArea is impressively fast and smooth. I’m afraid to say that transferring data between the PS Vita and a PC/Mac is a tedious process now compared to the drag-and-drop functionality found on PSP. The PS Vita does not appear as a USB storage device when connected to a computer. Instead, users will need to install a software called “Content Management Client” – the only software capable of talking to the PS Vita. Once that Client software has been installed, users will need to use its counterpart on the PS Vita and from there, send/receive files to the PC. The actual “file manager” exists on the PS Vita – you can only configure file directories with the Client software, and the PS Vita will automatically send the files to the selected folders. However, not all data can be copied to the PC. Users may also do a full backup of their PS Vita using this software. Also, the Content Management Client is not available for Mac OS yet. However, the PS Vita can also send files, or backup their console data, to a PS3 console via USB. All PS Vita games released on game cards will be available for download from the Playstation Store. Here is a compiled price comparison for some of the PS Vita games. Digital download copies are cheaper, but they are tied to a Playstation Network account and hence cannot be shared or resold. However, it allows owners to store multiple games within memory cards, making it more convenient to carry more games on the go without bringing along game cards – especially with a 32GB Memory card. Also, these owners will not have to worry about misplacing their game cards as they can always redownload their games from Playstation Network. What are the advantages of purchasing the game in the physical Game card form? Well, firstly you will be able to share your game with friends or resell it. However, when the game card is used in a different PS Vita system, all game save data will need to be erased in order to unlock trophies in the other system. Uncharted on a portable device. I don’t even know what to say when I heard the news early this year. 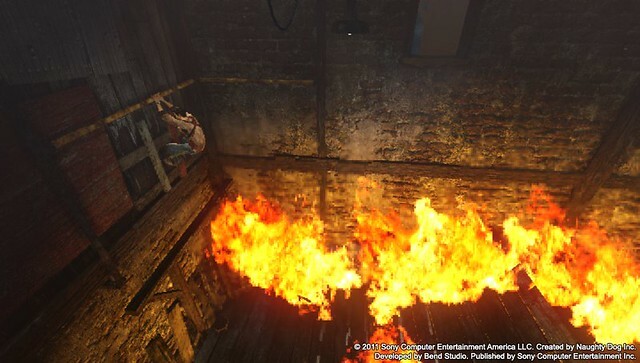 Golden Abyss is the prequel to the Uncharted game series released on PS3 (According to the game creators, this is NOT a direct prequel to Drake’s Fortune.) This action-adventure series (which spans 3 PS3 titles and this new PS Vita title) combines third-person shooter gameplay with platforming elements. 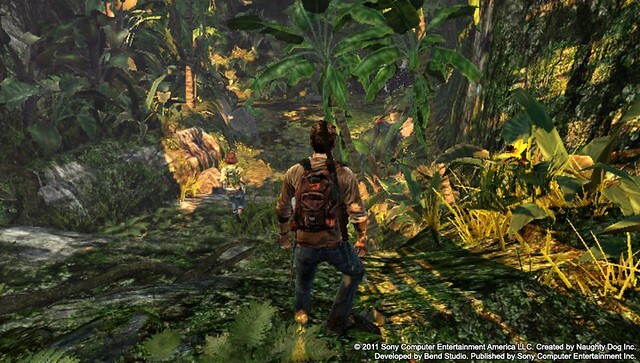 Players will get to explore dense jungle and exotic environments in one of Nathan Drake’s whirlwind adventures. These are in-game screenshots taken with my PS Vita. Interestingly, the game will leave a copyright mark on all screenshots. I’m not sure why, but the game looks better when it is playing – it has certainly lesser jagged edges as compared to these captured screenshots. The Hong Kong version of Uncharted: Golden Abyss has English voice acting and subtitles/menus in English, Traditional Chinese and Korean. Golden Abyss looks amazing on the PS Vita. 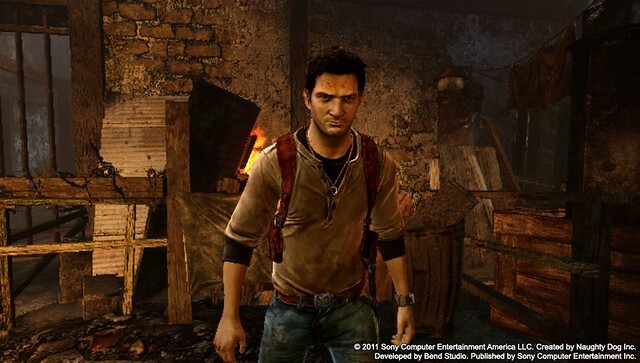 While it does not look exactly like the PS3 Uncharted games, the developers managed to capture the visual look of Uncharted for the PS Vita. It’s not as advanced as the later Uncharted titles – I’d say it’s close to Drake’s Fortune. There’s dynamic lighting, shadows, bloom and the specular highlights/glow on characters. 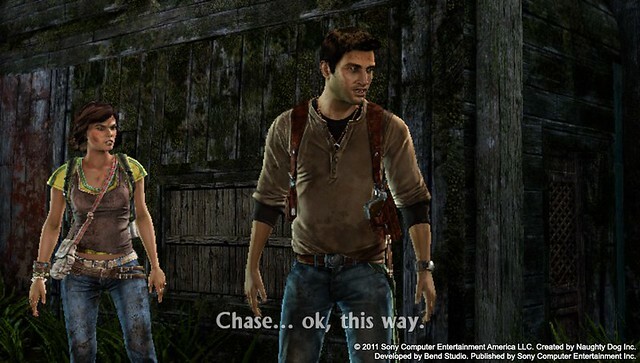 Just like the other Uncharted games, there are TONS of hidden items to find during Nathan’s adventures – urging players to replay the game a few times, especially in harder difficulties. There is no multiplayer mode in Golden Abyss, but from what I’ve seen in the in-game journal, the story has 34 chapters. Golden Abyss makes good use of PS Vita’s new features, such as the touch screen and rear touchpad. Shown above is one of Nathan’s “archaeological” activities. Players will need to clean the object by touching the front display, and rotate the object by swiping the rear touchpad. There are many puzzles that need the use of touch input. Generally, controls for movement are alright, although using the dual analog sticks for aiming needs practice. Players can also tilt the PS Vita (slowly) to align their shots. The touch screen is also useful for Nathan’s platforming escapades – players can tap on where they want Nathan to climb to, or even draw a path. It is the lazy way of clearing the platforming segments but definitely helpful for some of those complicated climbing sections. Playstation Vita feels like a portable version of the PS3 console, with incredible hardware specifications and extensive support for Playstation Network. Many game stores in Singapore imported PS Vita Value packs in Singapore. They are priced with a modest mark-up (between S$520~S$680). I would advise early adopters to purchase Value packs (as opposed to standalone) as the bundled items are useful and they are more expensive to buy separately. I had a Nintendo 3DS for half a year, and sold it to make way for the PS Vita. After a while, the 3DS feels just like the 3D version of the DS (which honestly, is what most people said it really is anyway). The 3D effect just works, but the graphics hardware is too weak to produce 3D graphics – there are games that run better (higher framerate or better visual effects) with 3D disabled. I feel that the 3DS’ greatest problem is with its software and pricing. Not everyone is going to pay S$59.90 to play Super Mario Kart in 3D. And also, no one is that desperate to pay USD3.99 for Super Mario Land (Original Gameboy) – the 3DS eShop is filled with overpriced games that only die-hard fans would patronize. It is also very unfriendly to game importers – the 3DS is region-locked and Nintendo really shot itself in the foot for doing that. There weren’t many good titles for the 3DS to begin with, and with many developers cancelling games, it seems that the platform’s strong titles are all from Nintendo. There really isn’t a point to hold on to a platform that has weak third-party developer support. Learning from Nintendo’s mistakes, Sony kept the PS Vita in the background until it was truly ready – many launch games, online features and the accumulation of gamers who are tired of Nintendo’s antics and first-party games. Good thing they delayed the system’s launch to build up an impressive launch library. 25 games will be available for the US launch next year. Some notable games include: Gravity Rush, Wipeout 2048, Lumines: Electronic Symphony, Touch My Katamari, Little Deviants and Dynasty Warriors NEXT. Also, Final Fantasy X HD will be (eventually) released on the PS Vita! Sony needs to make sure that the PS Vita has a strong and extensive software library without completely relying on first-party developers. Quantity isn’t everything, though. There are already discussions about “rotten” titles, such as Ridge Racer that only has 3 race tracks and 5 vehicles, the rest of the content exists as DLC. 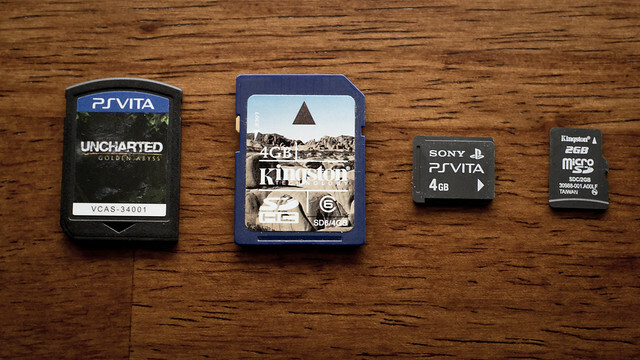 Keep in mind that a PS Vita memory card is mandatory for many game titles and the standalone console does not include any memory card. These new PS Vita memory cards are proprietary and not available from other memory card manufacturers (such as SanDisk, Kingston, Lexmark etc). Memory card capacity goes from 4GB to 32GB. The street price for the 32GB card is about S$159 in Singapore. If you intend to have a digital game library, you’ll definitely want to invest in a card with larger capacity. As for the non-Japanese gamers, we’ll have to wait till February 2012 when the PS Vita officially launches in the US to gain access to more English titles and the Playstation Network store. 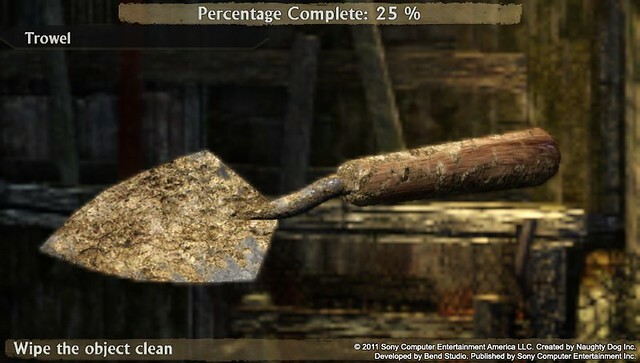 Meanwhile, I’ll be playing Uncharted: Golden Abyss until I unlock most of its trophies! I am once again amazed….. I just finished Uncharted 3 and am looking forward to get a Vita of my own. But I guess I will wait for the Singapore Version…. PS. Do you have a 3DS? I”m amazed too – we really have a lot of similar interests. I used to own a 3DS but I decided to sell it for the Vita. Since I am a fan of Zelda series….I will definitely keep my 3DS. I am coming back to Singapore in a few days. and of course I will go check out the parade! !